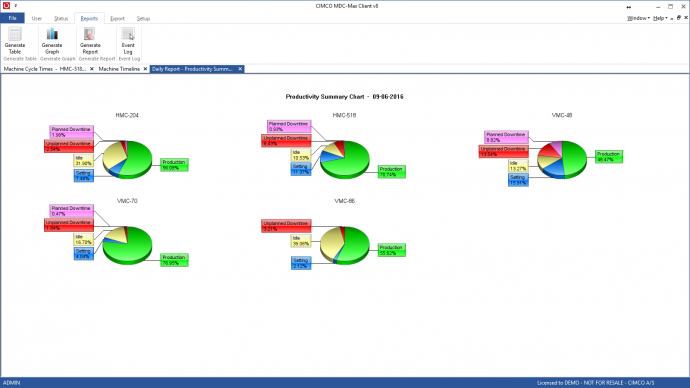 In CIMCO MDC-Max data is structured and visualized as reports. You can setup MDC-Max to generate both real-time and historic reports based on the data collected. MDC-Max features a modern tabbed interface where each open report is shown in a separate tap. This maximizes screen space for each report while allowing many reports to be open and updating in the background. 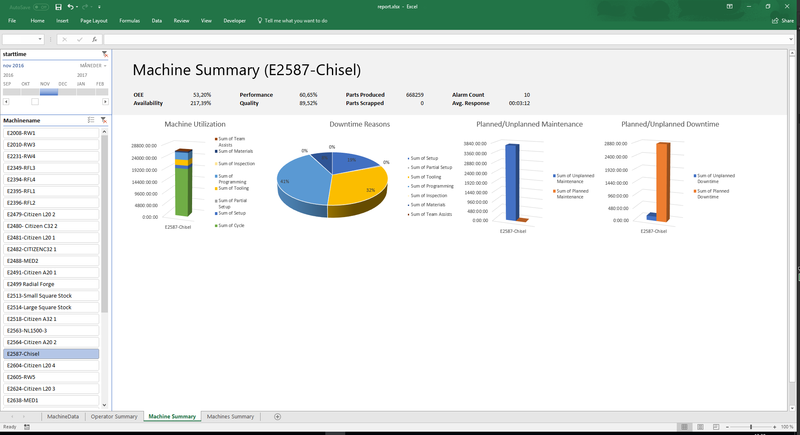 MDC-Max comes with built-in reports, but the true power lies in its ability to create customized reports. 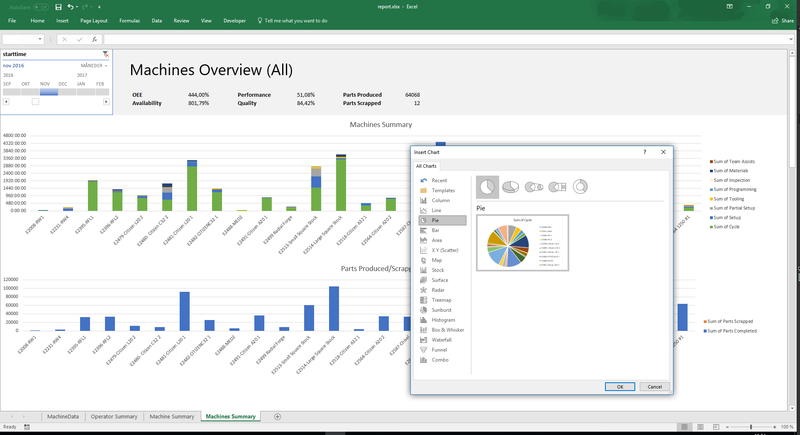 Visualize data as tables, pie or bar charts, add in production targets, work shifts, calculate key performance indicators such as OEE, MTBF, MTTR, and more. 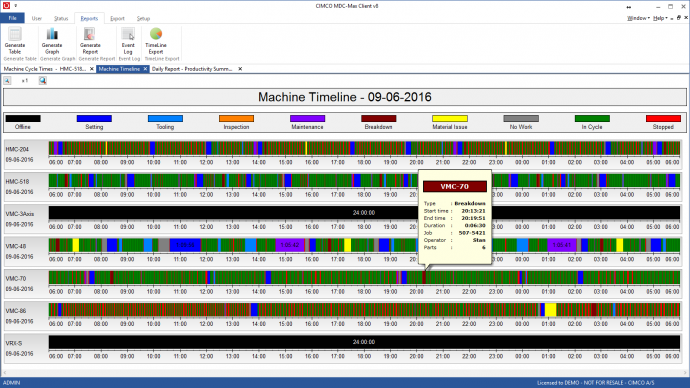 You can also generate event logs chronologically by operator, machine, and job to know exactly how each machine and operator is performing. MDC-Max also supports dynamic reporting where data is updated in real-time. Machine status can be visualized as timelines or Gantt charts with status changes shown with different bar colors so you can see at a glance what is going on. 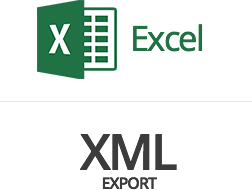 Automated Excel Reports for MDC-Max is a powerful and flexible reporting solution where data from MDC-Max can be imported directly into Excel without the need for the MDC-Max PC client. This enables anyone in your organisation, with the right permissions, to generate reports in Excel. Once reports are configured in Excel, they can easily be updated with the latest data by clicking a single button. Reports can be customized and visualized in Excel using any of the built-in graphs and charts. Excel simply presents a dialog that helps and simplifies the configuration of charts such as Column Chart, Line Chart, Pie Chart, Bar Chart, etc. 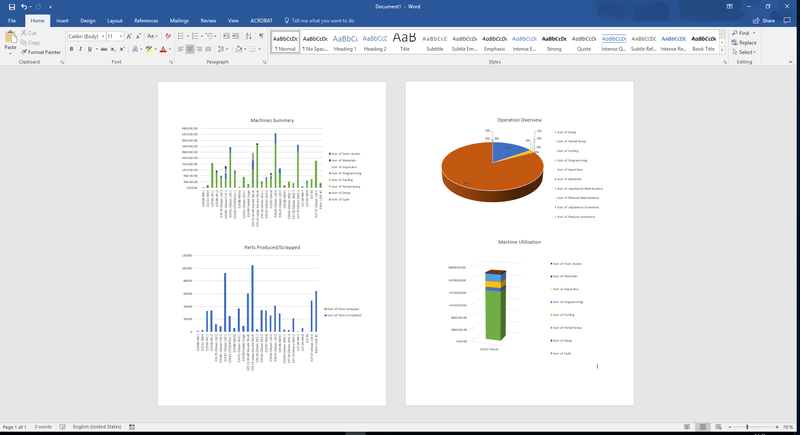 Reports can also be exported to nicely formattet Word or PDF documents. 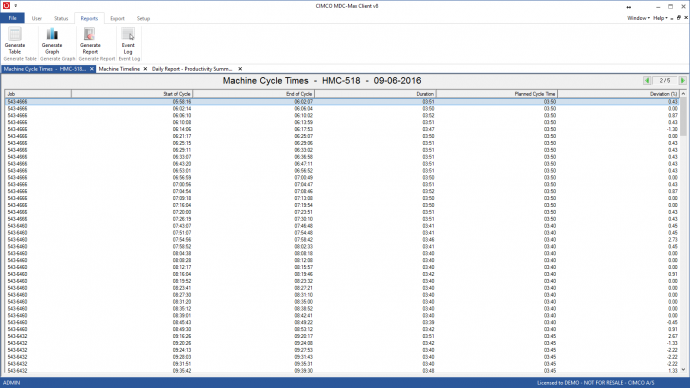 Reports such as Machine Summary and Operator Summary can contain all the relevant metrics in a single report including downtime reasons, parts produced/scrapped, cycle time, OEE and more. From a list, you can select one or more machines (or operators) and the report will automatically update to reflect the selection. That way, one report template can be configured and used for all machines, another for all operators and so forth. Using a timeline, you can easily zoom in to only show data from a specific time period such as a day, week, month or year. CIMCO MDC-Max comes with full support for Microsoft Excel spreadsheets. Reports can be exported easily for further analysis in Excel. MDC-Max can even update your Excel spreadsheet automatically, so the latest data is always available. CIMCO MDC-Max can also be integrated with most ERP/MPS systems on the market. This means you can have a completely integrated solution that can significantly reduce administrative tasks. Please contact us for more information about how CIMCO MDC-Max can be integrated with your software systems.